When Star Wars: The Force Awakens debuted two years ago, reaction from critics and most audiences was pretty solid. However, some noted the glaring similarities it shared with earlier instalments of the saga, as well as a few moments of fan-service which were sometimes hard to overlook (I personally had no problem with those things, but totally understand anyone that does). This has led to director J.J. Abrams’ film getting a small amount of backlash for being nothing more than a serviceable but ultimately safe reintegration of the franchises to end all franchises into modern day cinema. Rian Johnson, who takes over from Abrams with the next instalment The Last Jedi (don’t worry, Abrams will be back for Episode IX), seems to have made it his mission to defy those previous criticisms with his first contribution to the Star Wars canon, and in doing so has made quite possibly the riskiest and most unique movie to ever be set in a galaxy far, far away since The Empire Strikes Back. It is also, to get right to the point, a hell of a fun ride and filled with all sorts of special moments that are sure to make fans of any age get excited in their seats. It’s hard to really go into specific details about the story in a review that’s meant to be completely devoid of specific details about the story, so here are the spoiler-free basics; Luke Skywalker (Mark Hamill), the legendary Jedi who’s in self-exile on a secluded planet, is approached by young Force-user Rey (Daisy Ridley) who requests his help in teaching her the ways of the Force, as well as in the ongoing battle between the First Order, led by the sinister and extremely powerful Supreme Leader Snoke (Andy Serkis), and the Resistance which is led by General Leia Organa (Carrie Fisher, in her final performance before her untimely death late last year). Meanwhile, there’s stuff happening on both sides, with defecting Stormtrooper Finn (John Boyega) and ace pilot Poe Dameron (Oscar Isaac) going their own missions to aid the Resistance and protect the galaxy, and Kylo Ren (Adam Driver) becoming increasingly conflicted about his path towards the dark side of the Force. That’s about all that can possibly be said without giving too much away, because to truly appreciate the narrative risks that Johnson has undertook it is best to go into this movie without knowing a whole lot about what happens. What you should know before going in, however, is that this is not your typical Star Wars movie. Johnson has managed to make something that truly challenges the audience while also entertaining the holy hell out of them, a trait that also exists in his previous films Brick, The Brothers Bloom and Looper (as well as the handful of Breaking Bad episodes he directed), and that he brings to a much more mainstream audience here with enormous success. Through some tightly edited sequences, close-up camera tricks, and of course some stunning visual effects, he has introduced a whole new level of surreality to the saga, a kind that’s not been seen since that weird cave scene in Empire, and along with it a much more intimate and even personal method of filmmaking that really hones in on the characters and their very different journeys in this ongoing intergalactic war. It gives plenty of time to Rey and Luke, to Leia, Finn, Poe, fun new addition Rose (a wonderful Kelly Marie Tran) and the rest of the Resistance, and to the more shadowy figures within the First Order, like Kylo Ren who continues to be one of the most fascinating and unpredictable villains in Star Wars history, and each one of them gets a chance to really shine both as on-screen heroes and villains, as well as strong characters in their own right, thanks to Johnson’s ability to emotionally connect you with every single one of them. You’ll laugh, cry, have fun, be scared, and experience all other types of emotions with these characters because they are written so strongly and explored quite thoroughly to help you truly understand where they’re coming from, and what is leading them down these very different paths. As well as giving you plenty of material to digest afterwards – though a second viewing at the very least is required to fully internalise it all – Johnson still never forgets to give you a hell of a good time, with some fun action set-pieces and creative new worlds that make this galaxy a lot more three-dimensional than critics tend to give it credit for, as well as a strong sense of humour that will delight both young and old members of the audiences, and not to mention some truly powerful moments that have been a long time coming for certain characters. 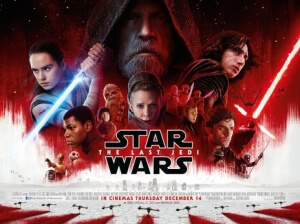 It is a little long, but it’s filled with enough exciting material to help it go by fairly smoothly, and while there are bound to be some things about it that will remain pretty divisive among even the most dedicated fans, let’s be honest: when has there NOT been something in a Star Wars movie that’s caused a bit of a rift between audiences of differing opinions? A lot of what happens in this film as well as The Force Awakens (and probably whatever Episode IX will be called) will certainly still be debated many years later, just as aspects of the original trilogy and even the prequels are still being talked about to this day, but that’s all part of what helps this saga to stay so popular, the fact that all of these films, quality aside, are challenging and entertaining enough to be discussed decades after their initial debuts. The Last Jedi is certainly going to be remembered as the one where Star Wars launched itself in a brand-new direction that’s as hopeful and optimistic as the note it leaves us on, and further proof that the saga is, after years of being firmly in George Lucas’ tight grip, in far better hands than ever. Star Wars: The Last Jedi is a thrilling and challenging new entry into the saga, which takes characters and storylines in a brand-new and unexpected direction that, thanks to writer-director Rian Johnson’s input, makes the franchise seem stronger than it ever has been, at least not since The Empire Strikes Back.